Last week’s WPA Guide to the Magnolia State mentioned the Natchez mansion “Concord” very prominently in its discussion of the evolution of architecture in Mississippi. Concord must have been an amazing place because although it burned in 1901, it has been mentioned in most architectural histories of the state from a 1903 article in the Publications of the Mississippi Historical Society to the WPA Guide (1938) to Frazer Smith’s White Pillars (1940) and Mary Carol Miller’s Lost Mansions of Mississippi (1996). 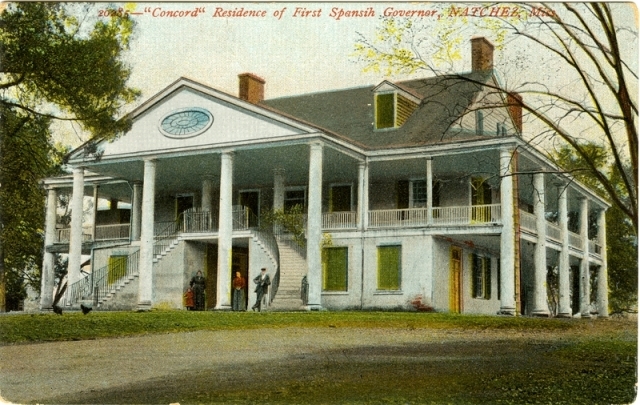 Thankfully, this one photo of the house survives, and its use as a postcard well into the 20th century further confirms the legacy the house held in the memory of Natchezians and Mississippians in general. 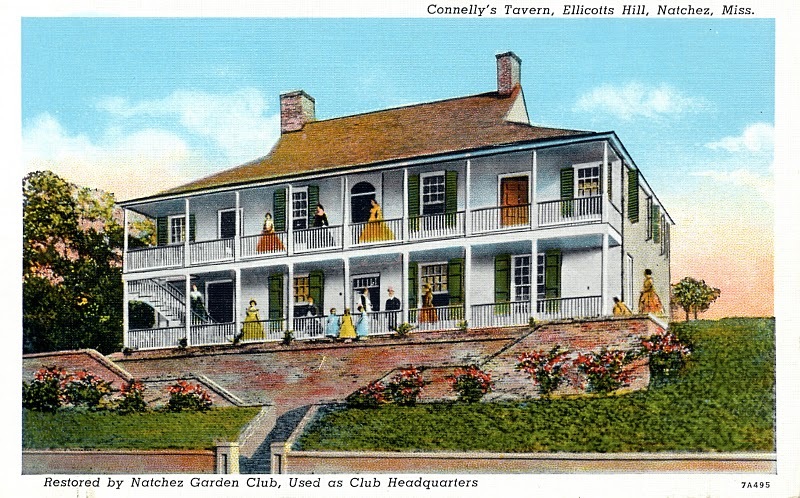 As we noted in the later discussion after last week’s post, the original house resembled Ellicott’s Hill, with a front gallery under the main roof. 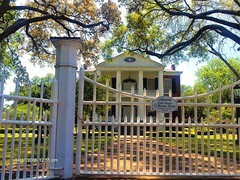 Later in the 1810s, under the ownership of Steven Minor, the distinctive classical portico and side galleries were added, possibly designed by Levi Weeks, the architect of Auburn (1812), a Natchez mansion thought to be the first use of the classical orders in the form of “white columns” we’ve all come to associate with the antebellum South. 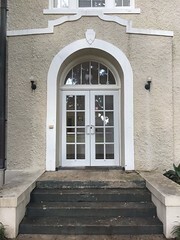 Many early authors assumed Concord’s portico was original and thus ascribed a level of sophistication to the Spanish period that really came later in the American period. Nevertheless, the house was important both architecturally and historically, and was seen as such before it burned, as you can see below. Another grand old ante-bellum mansion, one of the many that have made this section famous, lies in ruins, a victim of the fire fiend. The mansion in question is the historic old “Concord,” built by the Spanish Governor, Carlos de Grand Pre, in 1789, who was commandant here from 1786 to 1792. It was then known as “Grand Pre.” In 1792 Don Manuel Gayosa de Lemos succeeded Governor Grand Pre and he changed the name of the mansion to “Concord.” In 1792 [I believe this should read 1798] Stephen Minor of Philadelphia succeeded Governor Gayosa and occupied “Concord.” The mansion remained as the property of the Minors until some years ago when it was sold to Dr. Stephen Kelly, president of the Fifth National bank of New York, but formerly of this city. 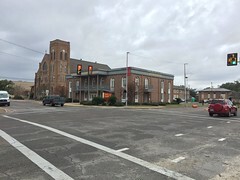 As fate would have it, Dr. Kelly’s son arrived in Natchez day before yesterday on his bridal tour and is now occupying “Melrose,” another old ante-bellum mansion of the Kelly estate. 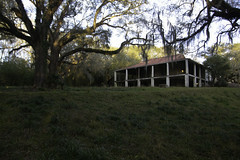 Concord is in a large grove and was built of brick with a large wide gallery extending around the four sides. A double stone staircase leads from the grand driveway to the second floor. The mantels were of marble quarried in Spain and brought here for Grand Pre. One of the historical incidents mentioned in connection with Concord is the story that in the old library at “Concord” Aaron Burr endeavored to persuade Governor Minor to co-operate with him in his nefarious plot against the Federal Government. Among the noted men who have been entertained at “Concord” were General Anthony Wayne, General Lafayette, Jefferson Davis, Aaron Burr and Winthrop Sargeant, the first territorial governor of this State. The entertainments at Concord were the most famous and lavish ever given in this section, even in the days when regal splendor was the order at all the social divertissements of the upper ten. Of late years the place has been occupied by Mr. Herman Stier, a well known and prosperous meat butcher. It was just after the town clocks struck the hour of 12 yesterday afternoon that the alarm was turned in. Though “Concord” was a mile beyond city limits the volunteer department hastened to respond. The firemen performed heroic work, but they were dependent upon a few cisterns for their water supply, which was very poor indeed. The old mansion was doomed. The firemen assisted by numerous citizens directed their first efforts to saving the furniture in the building and succeeded in their endeavors. Several of the rich marble mantels that were brought from Spain to add their splendid beauty to the magnificence of “Concord” were taken out before the roof caved in, but some were broken and will be of little use, save as mementoes of the famous mansion. After the fire had played its part the relic hunters picked up small pieces of blackened stone broken from the cornices, also a product of Spanish stone quarries. The value of the building was beyond estimate. In historic interest its value was beyond price, as its was easily the most famous of all antebellum mansions. It was insured for $2500 through the Metcalfe Insurance Agency and $2500 through Major John Rawle’s insurance agency, making a total of $5000. Few cities of the South could claim such an environment of really historic homes as Natchez. The residence of the first Spanish governor, Grand Pre, by name, is situated in the center of extensive grounds which were for many years kept in highest cultivation. It is a massive building. Circular flights of stone steps lead up to the broad halls. These steps, together with the mantels and cornices of fine marble, were hewn in some ‘forgotten quarry of Spain,’ and in conjunction with the long colonnades stretching on every side verify the wealth and resources of that early time. The house, very much as it stands now, was erected in 1789. 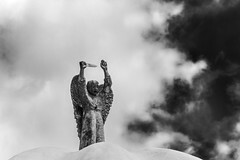 Governor Grand Pre was succeeded by Gayoso, who gave the place the name it still bears, ‘Concord,’ to accentuate the kindly feeling supposed to exists between the citizens and the government. Important business transactions occurred during his term, which not proving entirely satisfactory to the higher authorities, the urbane Gayoso was recalled to New Orleans and Don Estevan Minor was appointed. 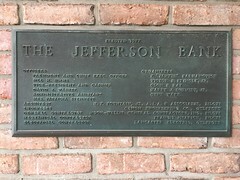 He purchased the mansion and resided there until his death, in 1815. His family and their descendants occupied it for many years, making it the center of social refinement and culture. A branch of the Minors still live near Natchez, at a sweet, quiet home called ‘Oakland,’ famous for its avenue of live oak trees, standing at a distance of sixty feet apart, [their] magnificent branches, meeting [to form] a complete archway.